Ernest Baker. Ernest Baker was born in South Stoke (Stoke Rochford) about 1899, youngest son of Robert Baker (born Caythorpe) and Mary. In 1901 the family were living in Normanton (on Cliffe); in 1911 Ernest was living with his widowed mother in a labourer’s cottage in Hough, whilst his brother Arthur was working as a waggoner for Joseph Glossop in Gelston. Ernest enlisted in Grantham and served as a private (87510) in 86th Company, Machine Gun Corps. 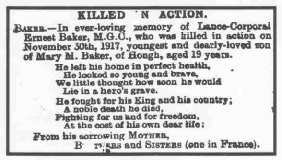 He was killed in action during the German counter-attack in the Battle of Cambrai, on 30 Nov 1917 (age 19). He has no known grave but is listed on the Cambrai Memorial.